Brexit talks continued and the Prime Minister Theresa May has been under increasing pressure during the week, amid Conservatives Annual Conference where her speech will be under scrutiny. Mr Johnson, the former foreign secretary, affirmed itself against the Chequers plan for Britain’s relations with the UK after it leaves the EU in a regular Daily Telegraph column on Friday. According to Mr. Johnson, the UK should negotiate a Canada-style free-trade deal. The Office for National statistics reported that GDP growth rate remained unchanged at 0.4 per cent QoQ in the period ended in June, in line with consensus. It was mainly driven by consumers, the rise in real wages, warmer weather and the football World Cup. On the other hand, most of this spending was financed by borrowings and savings. Consumers were net borrowers. However, the saving ratio was 3.9 per cent which is at historical highs. Business investments fell in UK by 0.7% QoQ, suggesting that companies were putting on hold they plans because of Brexit uncertainty. UK export fell 2.2% QoQ largely due to fall in exports of cars. This caused an increase in current account deficit, rising to 3.9% of GDP, from a 3% of previous quarter. The sterling fell by 0.37% and traded at $1.30280 by the end of the session. The yield on 10-year gilts rose by 1 basis point on the day to 1.57 per cent in Friday’s trading. Yields move inversely to price. Five-year gilts also rose by 2 basis points to 1.17 per cent and 2-year gilts remained unchanged to 0.8 per cent. The FTSE 100 closed at 7.510, which is 0.27% higher compared to last week. On Monday, Mario Draghi’s speech was supporting for a tighter labor market with rising wages and higher inflation expectations. This boosted Euro against Dollar early this week and Germany’s 10-year bond reached 0.514, the highest level since mid-June. The week ended with the Italian populist coalition decision to increase sharply the public spending, by aiming for a 2019 budget deficit of 2.4%. This is higher compared to this year planned deficit of 1.6% and it would be exactly 3 times higher compared to forecast of 08% for next year. The planned increase in spending would fulfil populist election promises, which includes a basic income and tax cut. This negatively effected Italian government bonds and bank stocks. 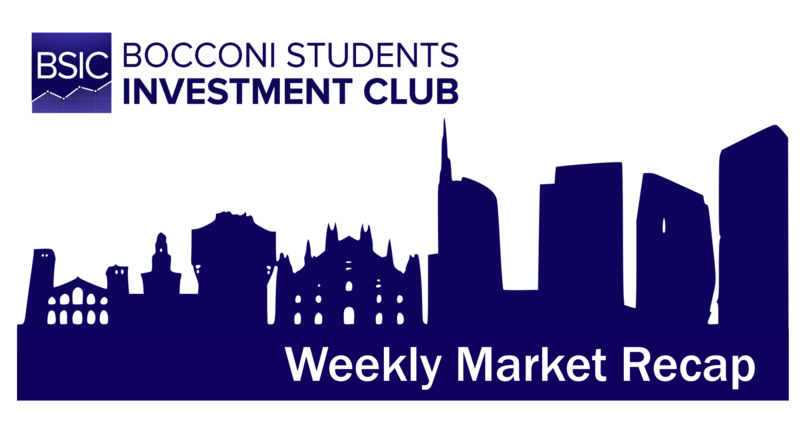 With Unicredit that fell almost 7% the same day and Intesa Sanpaolo tumbled 7.8%. Euro ended the week lower because of the Italian Budget and disappoint inflation. Eurodollar closed at 1.16080, with a weekly decrease of 1.2% compared to last week close of 1.1802. On the other hand, EUR gained against the CHF, which ended at 1.1382, it was 1.29% higher compared to last week close at 1.1261. FTSE MIB closed at 20,710, which is 3.1% lower compared last week, mainly driven by the pressure coming from budget decision. The 10-year Bund yields ended at 0.47, almost unchanged compared to last week close. Italian 10-year yield rose to 3.14, which is 25bp higher compared to last week. Italian BTP spread over 10-year Bund rose to 267.20, up from the last week close of 220.7. Economic releases in the upcoming week include Euro Area Unemployment rate for the month of August (expected 8.2%), Manufacturing PMI for August (expected 53.3) and Retail sales for August (expected 0.2% MoM). The trading-week has closed with US major indexes closing near to all-time high. In particular, the S&P 500 has reached 2921,50, Dow Jones has closed at 26458,31 and the Nasdaq 100 at 8046,35. During the week, on Wednesday, the Federal Reserve Bank, has risen the interest rates by 25 bp, now between 2% and 2,25%. Anyway, the market hasn’t reacted badly as widely planned. What has been influenced by the decision of the central bank is the euro-dollar exchange that and the beginning of the trading week was at 1,1745 and has closed at 1,1604, that means that the dollar has appreciated around 1,2% on the euro during this week. On Friday, following the charges of the Security and Exchange commission, TESLA stock (TSLA) have lost 13,9% of their value, closing at 264,77$. Apple stocks (AAPL) during the week have increased their value by 3,31% from 218,50$ to 225,74$ moving near the all-time high of 229,64$ reached at the beginning of the September. MOEX index has increased by 1,8%, at 2475,36. RTSI index has grown by 2,9%, closing at 1192,04. All most important Chinese indexes, the Shanghai Composite, the SZSE Component, the China A50 e the DJ Shanghai have closed the trading week increasing their value.